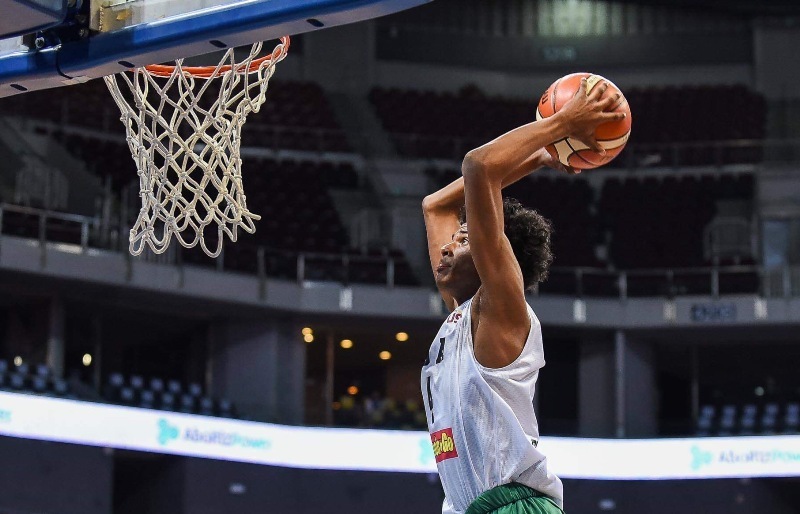 Jalen Green played true to expectations as he powered FilAm Sports USA to a breezy 78-45 win over AusPinoy in the Seeding Round of the 2019 Chooks-to-Go NBTC League National Finals presented by SM Monday evening at the SM Mall of Asia Arena. Green, the top prospect in the US NCAA recruitment class of 2020, dazzled the crowd with his aerial acrobatics to finish with 20 points, nine rebounds, and three assists in the win. Green conspired with athletic big man Kainoa Ballungay as they jumped to a big lead early and never looked back to set a date with Perpetual JONELTA-Laguna in the Super 32 commencing on Tuesday still at the same venue. “Ngayon lang sila maglalaro as a team from different states in the US kaya I’m glad na we won,” said FilAm Sports head coach Bong Ulep. “Medyo nung first half, ‘di masyado makita yung chemistry. Sloppy ball game, as expected, pero nung second half, nag-pick up naman. Medyo umayos nang konti,” he added. Ballungay added 19 points, 12 rebounds and three blocks. Eli Ramos, brother of Gilas prospect Dwight Ramos, finished with 14 points, five rebounds, and three assists. Jasper Rentoy was the lone bright spot for the Aussies as he finished with 19 points, six rebounds, and two steals. Australia moves on to a matchup with Cagayan de Oro’s Southern Philippine Colleges in the next round of the national high school championship sponsored by Chooks-to-Go, Darlington-Exped Socks, EPSON, Huawei, Freego, Purefoods, Gatorade, Go for Gold, SM, Molten, and presented by 5Plus and Lighthouse Events. In other games, Toronto’s Durham Crossover took out FEU-Diliman, 69-66, to forge a duel with First City Providential College. The Baby Tamaraws will then take on St. Augustine Institute of Pampanga. Hope Christian dominated from start to finish to claim a 68-59 win over Italy Proudly Pinoy and arranged a matchup with Legazpi’s Sto. Domingo National High School. Italy, on the other hand, will meet Calayan Educational Foundation from Lucena. In the final game, Camp David of New Zealand came away with a 84-71 win over Top Flight Vancouver to set up a battle with St. Louis of Don Bosco-Dumaguete. Conversely, Vancouver will be pitted against St. Mary’s College of Tagum. The week-long tournament from March 18 to 24 will be free of admission, with fans needing just a valid ID to enter the SM Mall of Asia Arena.